In the northeast of Magic Kingdom, for some time now a new area has been slowly taking shape. No longer a fully sovereign entity from Fantasyland, Storybook Circus has been expanding to fill the footprint of what once was the park's absolute nadir of themed areas: Mickey's Toontown Fair. Toontown was largely groan-worthy, a middling collection of half-ideas. Storybook Circus is, with some qualifications, pretty excellent, and this despite having a smaller area and a chief purpose no more ambitious than when this space was occupied by Toon houses. Yet the Circus is undoubtably more compelling and has been very well reviewed, and really digging into what makes this area work beyond the usual superlatives of "color!" and "texture!" is an experiment well worth carrying out. Let's get to it. Storybook Circus is what one could call a "microland" - an area of minor square footage with a unique theme often presented as a sort of side-attraction to a larger area, usually designed exclusively to anchor a major attraction - Caribbean Plaza is one example, and Bear Country, at Disneyland, can be seen as another. Storybook Circus houses a number of attractions aimed at children, none of which are really much better than "C ticket" level attractions - Dumbo, a kiddie coaster, a train station, and a water play area. What distinguishes these "C" tickets is that they are given "E" level treatment in Storybook Circus. But to really dig into the accomplishment of Storybook Circus, we have to first reacquaint ourselves with the history of Disney's "official" kiddie zones. It used to be that the totality of the experience of a Disney park was aimed at the entire family, and the whole experience was understood to be, in some ways, juvenile, regressive, a return to youthful wonder. There have always been exceptions - the Great Moments with Mr. Lincolns and Hall of Presidents of the world - but these were in the minority. Disneyland and The Magic Kingdom were designed to be of interest to people of all ages, and this accounts for their staying power. The rift began, I think, in 1982. EPCOT Center was the very first Disney theme park to address itself to a specifically adult audience, where Bass ale replaced Pepsi and epicurian dining supplanted burgers and hot dogs. 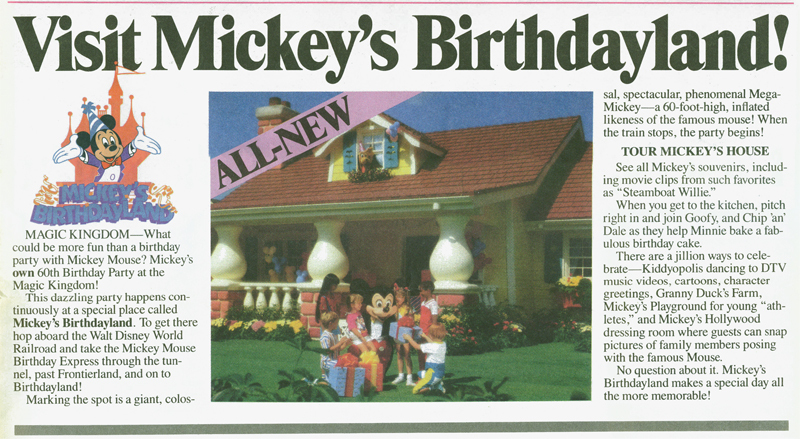 In response, Magic Kingdom began to swing in a more juvenile direction, a process fulfilled by the opening of Mickey's Birthdayland in 1988. Yes, Mickey's Birthdayland. 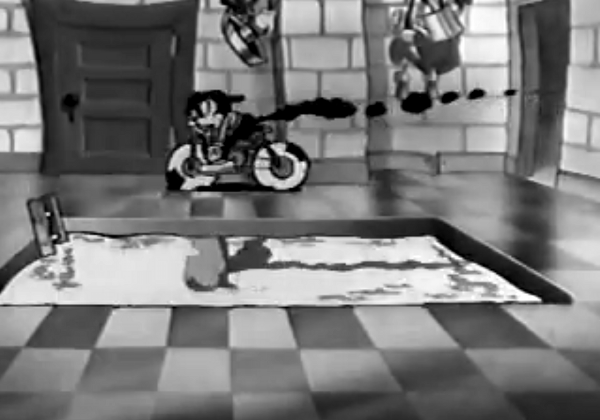 Mickey's Birthdayland was created to ostensibly celebrate the 60th birthday of Mickey Mouse, and was carved out of a small access road between 20,000 Leagues Under the Sea and the Grand Prix, achieved by shortening the car race attraction by several hundred feet. It consisted of a petting zoo, hedge maze, some tents, very crude "Duckburg" facades, and the main attraction - Mickey's House, which was a walkthrough exhibit comparable in concept to the Swiss Family Treehouse with a Mickey stage show at the very back. There was also a separate tent which housed an opportunity to meet Mickey in his dressing room. Why his dressing room? Because after leaving his house you'd enter a warren of tents which housed a large stage where the "Minnie's Surprise Party" show would be performed, making the separate dressing room attraction a logical extension of the stage - truthfully, the reason for the area to exist. It's worth dwelling on that for just a moment because each new version of the "Meet Mickey" attraction in its various guises has never really strayed from the dressing room concept, one which was only beholden to the stage and the area's temporary nature to exist. 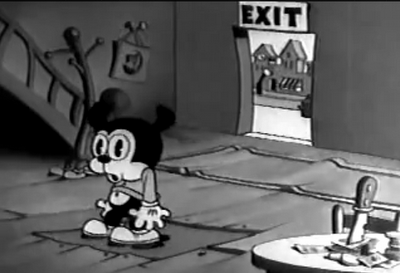 But "Meet Mickey" outgrew its intended purpose. From the late 50's until the late 80's, meeting Mickey was largely a randomized affair, much as meeting other characters was until fairly recently, where one could walk by any old Magic Kingdom facade and unexpectedly find Mickey standing nearby. It was a spontaneous process, one open to chance and improvisation, which is why it captured the imagination of the public. But it was not until Mickey established a permanent headquarters and guests were told that all they had to do was get in line and be guaranteed an "audience" with Mickey that this simple side-activity began to morph into something ominously important. Today there is hardly a single spontaneous character interaction left anywhere in the theme parks, so Mickey's Birthdayland actually is the start of a massive shift in the public's perception of the code of conduct of these costumed mascots. Birthdayland was otherwise hardly important or revolutionary. I saw it many times as a child and I can hardly remember anything about it except that when you reached a dead end in the hedge maze, you would get squirted by a colorful plastic pole. Although it was a temporary area done on a big scale, it was still a temporary area. Seen today, the most interesting thing about the Birthdayland area is its indebtedness to the Disney comic books. Mickey's Birthdayland was "set" in Duckburg, USA, and the style of the buildings and scenic details was a loving tribute not to Duck Tales, but to the famous Uncle Scrooge comics by Carl Barks. This meant that the area did have a classic "Disney" feel appropriate to the Magic Kingdom, even if the "Disney" feel was decidedly... low rent. That would have been well and good and the area would have eventually faded out, the Mickey attraction relocated, and all could have been well. But even before the area was rechristened "Mickey's Starland" and made an official permanent part of the Magic Kingdom, something happened to alter its destiny. 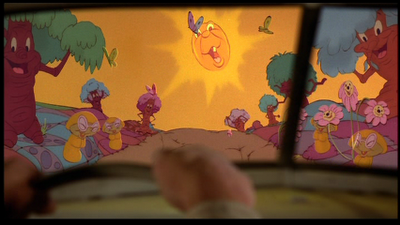 Just four days after Mickey's Birthdayland opened in 1988, Who Framed Roger Rabbit premiered in theaters. Take a moment to look at the loving detail put into loose floorboards, that crooked picture staked to the wall, the menacing tableau of the knife and cards at the front, or that dusty old kicked-up floor rug at the back. Think of how much easier it would have been to draw a rug that lay nicely and orderly flat on the floor, in the way the Disney studio would have done. This is what Toontown was channeling to derive it's hellish urban atmosphere. Toontown was a fantastic invention for Who Framed Roger Rabbit, but treating the concept as canonical across the board and good for all American animation does a great disservice to the Disney, Warners, and Lantz characters who also appeared in the film, all of whom emerged from unique aesthetic styles and studios. It probably seems like I'm being very down on Roger Rabbit, and I'm not. The film is wonderful, and it's grown into a real classic. 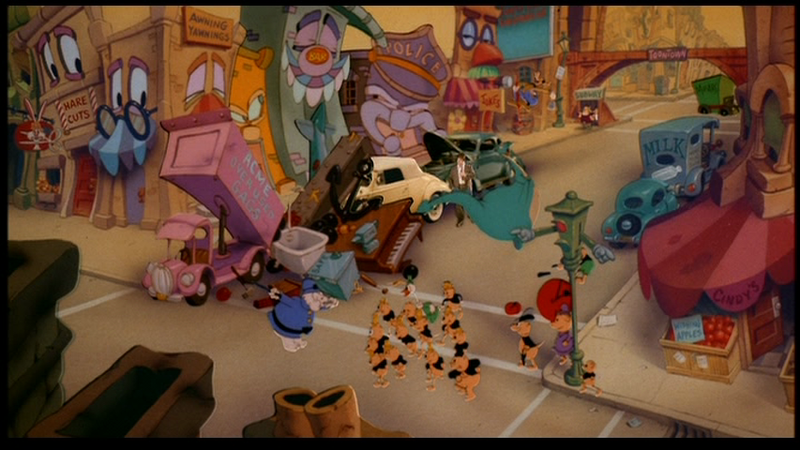 But replicating the style of the "Toontown" sequence into an entire area which only the Disney characters inhabit was a real mistake. That style was only ever devised to make a universe where Mickey Mouse and Bugs Bunny - two characters who starred in very different films from very different studios - live in the same place and seem credible. 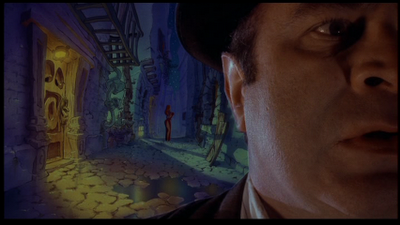 The style of Who Framed Roger Rabbit is not that of Disney animation. It wasn't even released as a Disney film, but under the "Touchstone" banner invented by Ron Miller in the early 80s. There is also something to be said about the wisdom of attempting to recreate this particular visual style at all: buildings designed to move and sway and sing are one thing, but building the style necessarily involves freezing it into plaster and lathe and in that process something is lost. 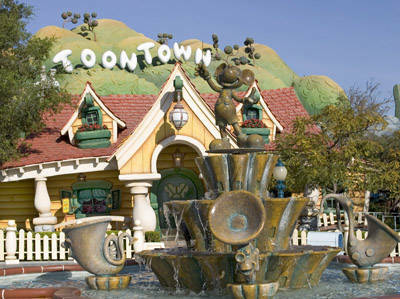 Yet by 1993, the "Toontown" concept had already spread like crab grass. Some of you may remember the "Bonkers" cartoon of the early 90s, with Bonkers being a Toontown cop, an unacknowledged riff of the Roger Rabbit franchise. What Disneyland built in 1993 is what people of that era would have expected to see, and there is of course a Roger Rabbit ride nearby to motivate the style. 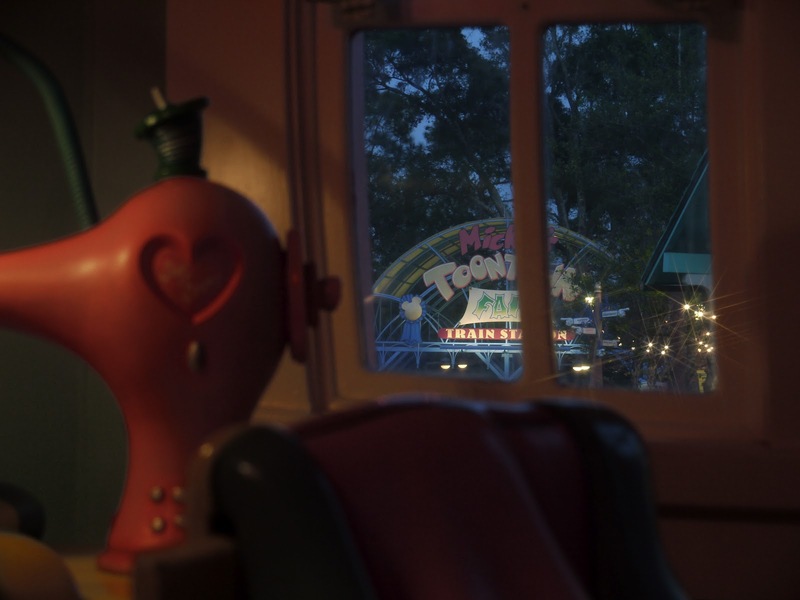 But doing so means that the "Toontown" concept was replacing over sixty years of visual continuity of films and in cartoons and even theme parks. Despite the name, this was in no way "Mickey's" Toontown. For Walt Disney World's 25th anniversary in 1996, Mickey's Starland was converted into Mickey's Toontown Fair. Along with the genius idea to turn the castle into a pink birthday cake, it was a year of highly suspect "birthday gifts". Toontown Fair was certainly more elaborate and unique than Starland, introducing a kiddie coaster and a very nice Minnie's House attraction to compliment Mickey's House. It was ambitious, yes. But with ambition came clutter. The idea itself made very little sense. 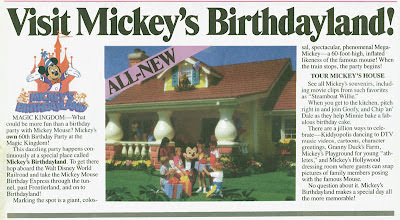 The "Birthday Tents" sort of made sense as places where birthdays conceivably could be held, and in the span since 1988 had achieved some importance as revenue centers for the Magic Kingdom - the "Meet Mickey" tent in particular. Meet Mickey was moved to the tent nearest the railroad tracks so the "Mickey's House" queue led directly into it, and the house itself was remodeled at this time. This is a shame because this remodel was a significant downgrade. What had previously come off as a pretty credible place where Mickey could live was toonified, filled with "inflated" architecture, and many scenes lost their pictorial elegance, especially the kitchen which became a disaster zone courtesy of Donald Duck. The other tents became shops and character greeting areas, probably as mandated by a limited budget and a theme park reluctant to give rid of an already profitable complex. We'll hear this again in ten years. Due to its limited footprint, Toontown offered a lot to look at but very little in the way of the large depth compositions that the rest of the Magic Kingdom is filled with - and whatever the merits of Starland, it wasn't cluttered. 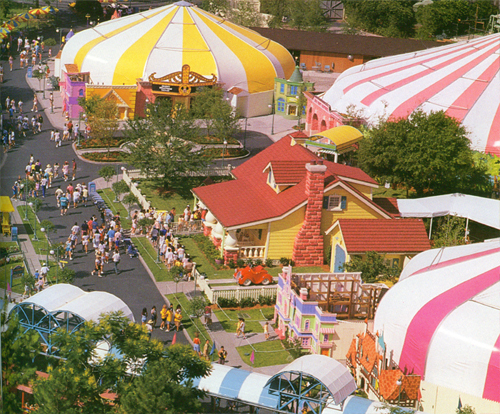 Toontown Fair generally looked far worse than it really was from most angles, with clashing colors, textures, and all form of visual input assaulting the eye. But it did align the area with the Disneyland Toontown and the Tokyo Disneyland incarnation opening that same year, making the "Toontown" concept a visually and conceptually integrated one across three theme parks of the Disney empire. 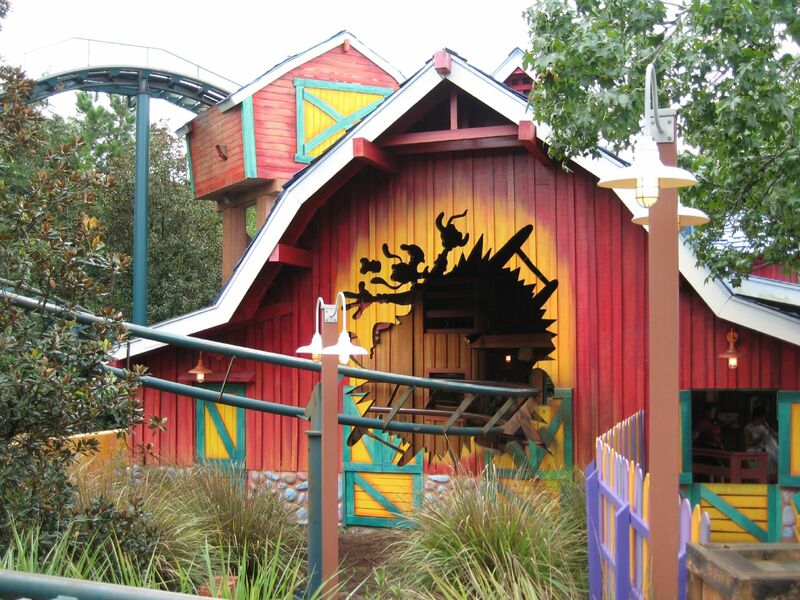 Other theme parks tried their own "Starland"s. Six Flags has had areas lightly themed to popular children's franchises such as Looney Tunes and The Wiggles since the early 90's. Universal Studios Florida opened Fievel's Playland in 1992, based on An American Adventure 2 but with a probable conceptual antecedent in the Honey, I Shrunk the Kids Playground which appeared at Disney-MGM Studios, down the road, in 1990. This firmly established the unofficial rule that theme park playgrounds can only be themed to areas where you're really small, because kids like to feel even smaller than they are, or something. Disney is reluctant to let this idea go, recycling it most recently in the lackluster Toy Story Playland. 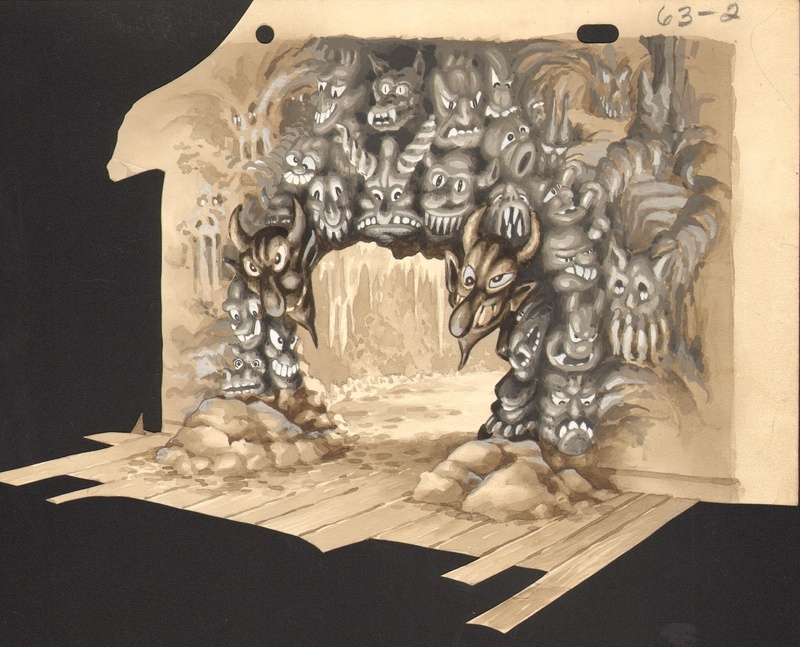 Meanwhile, Islands of Adventure ran with the idea of areas themed to illustration into no less than half of their 1999 Islands of Adventure park, drawing together areas based on American comics, Sunday Funny Papers, and illustrator Ted Geisel. It's hard to pick out exactly which of these areas is the "Toontown" - Universal Creative did an interesting job splicing aspects of the style across three distinct areas. Suess Landing has the droopy, flowing architecture but is really more comparable to a Fantasyland, with its simple flat rides and kid-oriented activities. Marvel Super Hero Island uses flat cutouts and perspective tricks to create a dynamic atmosphere, but Toon Lagoon comes nearest to the "Toowntown" mold, with balloony architecture and interactive street elements. And, if it be doubted, the "Sweet Haven" microland of Toon Lagoon is proof that balloony architecture and dimensional cartoon style, when done well, need not be as ugly as Mickey's Toontown. The fact that Sweet Haven is themed around Popeye, a character created by Max Fleischer Studios, only deepens the irony. One suspects that Disney just isn't very good at making things look toony and credibly grotesque. I trace this entire history of "kiddie" areas up because I think it's essential to keep all of this in mind when talking about Storybook Circus. 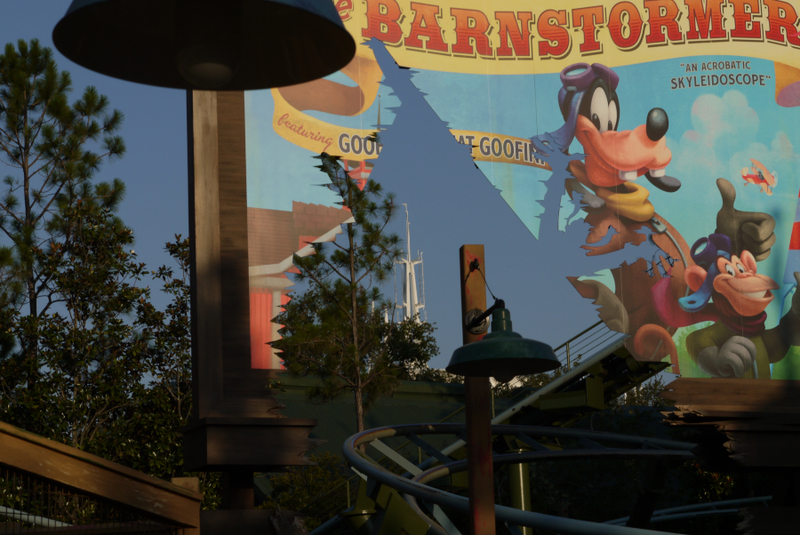 Mickey's Toontown is your baseline, that's what to expect. Twenty years of theme park history across all of the major industry players have conditioned us to associate areas of the park for children with distorted fiberglass architecture, limited texture, balloony scenic elements, and a less than attentive regard for fine detail. It is very much to the credit of Storybook Circus that it whole heartedly rejects all of these things. I think this is very much responsible for the initial surge of very enthusiastic reviews this area has received, although that initial wave was reviewing only a tiny sliver of what the area will eventually become. Still, some of the early positive coverage was in large part due to an immediate instinctual understanding that Storybook Circus was not to be Toontown Fair Mach 2, but a new kind of "kid zone". I personally think that this time around Imagineering has finally delivered something that fulfills the demands of being an area "for kids" which also offers something for adults. It's an area that won't look absurd or dated in ten years because it turns the clock back to a design sense that existed before the concept of a kid's area did. It is classical, and so it has an inherent longevity. Storybook Circus is still under construction but at this point enough of it has been built that I feel that a review of it's complexities would not be a disservice. To begin to discuss Circus, we should discuss how it came to be. 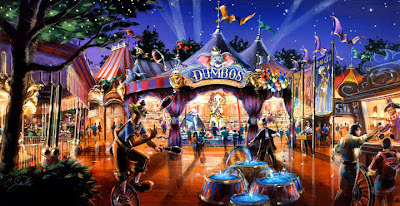 An expanded version of Dumbo had been planned for Magic Kingdom for some time, based on a two-sided Dumbo attraction with a water play between the two spokes first designed for Tokyo Disneyland. This Tokyo concept art is what was first shown to the public as the new Florida Dumbo. See Cinderella's Golden Carrousel off to the left there? 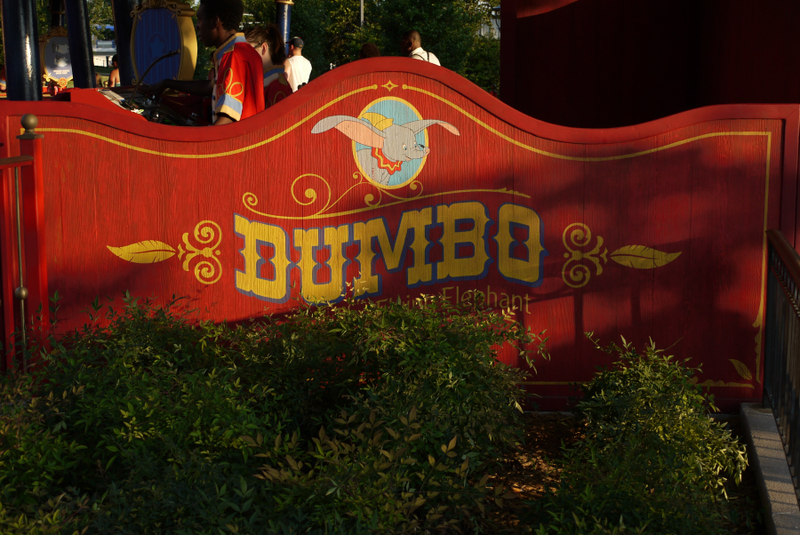 In Florida, Dumbo was slated to appear in an area around the Fantasyland Train Station also accommodating the Disney Fairies merchandise line and some new version of the "Barnstormer" kiddie coaster. This was in what we could call the "Jay Rasulo" version of the Fantasyland expansion project. Rasulo had been making his bread and butter on the Princess franchises for some time, and the initial Fantasyland Expansion plans reflected this clearly. Once Tom Staggs took over as Parks Chairman in 2010, the Expansion was called back for re-writes. In the interim, Walt Disney World had gotten cold feet on the "Fairies" franchise. Despite the enthustic support of John Lasseter, 2009's direct-to-video Tinkerbell sequel sold about half of what the initial one had, and the pixies had yet to find a consistent audience or place in the parks. Instead of gamble on an expensive area, Operations requested that the successful Toontown Fair tents be retained (I told you we'd be hearing that again). And thus Dumbo's circus expanded to fill the whole area. This shows the greatly improved layout, foliage, and colors that have actually begun to be installed on the old Toontown Fair site. Still, questions remained. Why a circus? Do people today connect to the concept of a circus as an exciting, desirable entertainment venue? Wouldn't this look more temporary than the area it was replacing? Storybook Circus seems very much to be an evolution of the "Dumbo Circusland" developed for Disneyland in 1972, with it's entrance marquee, scattering of tents, and central Dumbo attraction. It's also interesting to consider that as early as 1972, there was sufficient demand for Dumbo to split it off into its own dedicated area. Although the model isn't very detailed, it also doesn't take much to imagine that this area would end up looking tired pretty quickly. But the concept lingered on until the late 70's, when it was probably killed by the decision to redo Fantasyland entirely. Storybook Circus is a great deal more ambitious than it needs to be, and that begins with the fact that it is an area with a history. It doesn't have a backstory, contrary to the tedious modern Imagineering tendency to explain every single thing with a convoluted and impossible to comprehend motivating narrative. Storybook Circus invites scrutiny but pleases in the same way the original areas of the Magic Kingdom do: by implying more than it says. One doesn't read Storybook Circus, she reads into it. The Circus is set up in an area which clearly previously existed before the Circus' arrival. 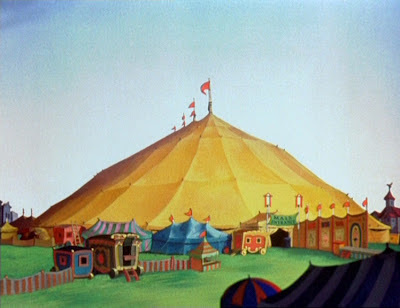 Dumbo is set in Florida, but the Circus is not a Floridian one; it's set up somewhere in the Midwest, what was probably a little cow town called Carolwood Park. 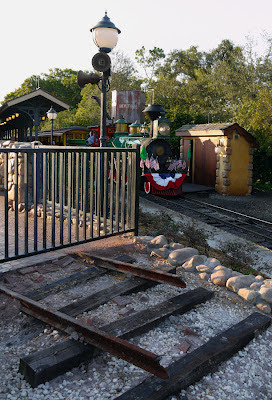 Carolwood Park contributes pre existing railroad tracks, billboards, barns, and train roundhouses to Storybook Circus, and gorgeously crafted rambling stone walls - implied farmland. Along with the heavily vegetated areas, this Circus brings to mind an atmosphere vintage and rural, some vaguely defined sense of pre-modernity. It's the imagined rural youth of American myth. Although the decision to not replicate the Florida setting of Dumbo seems at first blush to be a missed opportunity, calling the area "Carolwood Park" and hauling in an unexpected vintage patina allows the Imagineering team to bring in an unexpected thematic depth to the area. 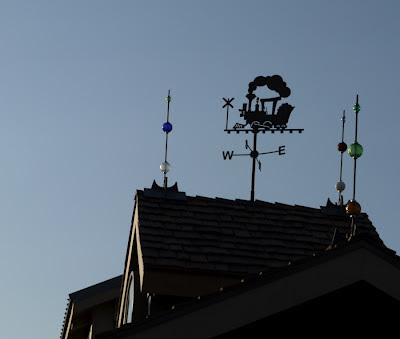 The use of the name "Carolwood" isn't just an empty name drop; although Dumbo is the reason for the area to exist, the star of the show is the Railroad. The railroad had previously provided important conceptual links on Main Street and Frontierland, but it grows into a central role in this area. When you enter, you're directly facing a train and train roundhouse - that's the introductory statement! Your other options include arriving on a train, or walking in via Tomorrowland and directly facing a train. WDI has covered all of the bases here. The entire area is, in fact, motivated by the train, because the Circus arrived on it. 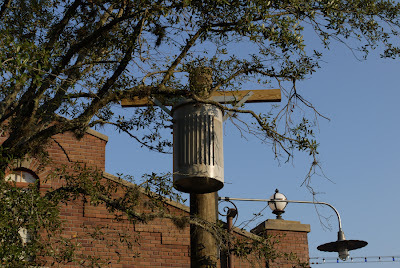 You can actually see the train spur line that branches off the Walt Disney World Railroad leading to a train turntable where the individual acts and circus wagons split off to set up. 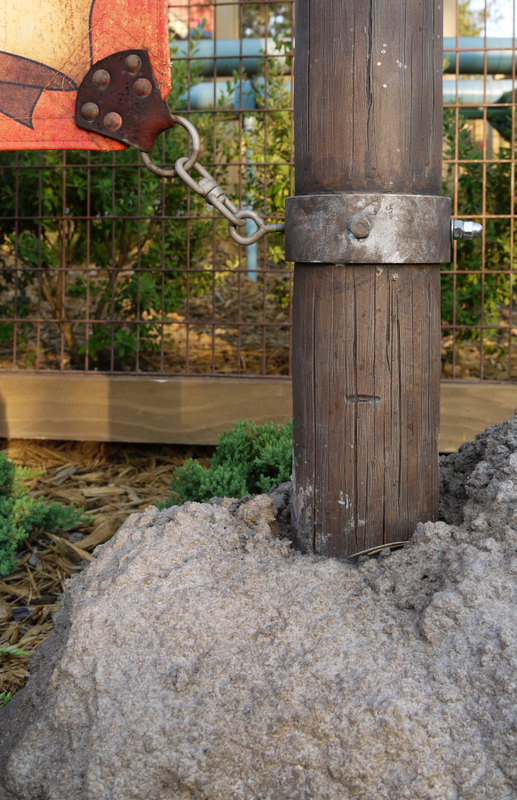 You can follow the wagon tracks in the "earth" as they roll off the turntable, a trail of peanuts embedded in the ground alongside animal tracks leading to Dumbo, monkey tracks towards the Barnstormer (where Goofy co-stars with a monkey), and so on. None of these subtle details are at all obvious or vie for your attention. This is the great thing about the Circus: it has a motivational integrity but you have to go looking for it. And of course by being called Carolwood Park, being set in the Midwest, in some far off once upon an Americana, the area brings in the ghost of Walt Disney's childhood. 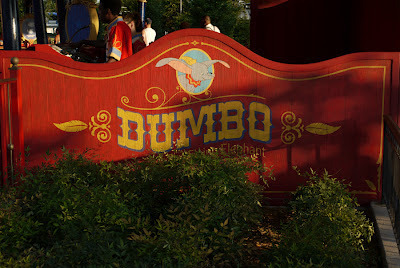 Disney harbored a fascination with the circus, of which Dumbo is only the most obvious example. There are also a scant dozen shorts, Toby Tyler and Fun and Fancy Free, and the fact that Disney bought and restored an entire Circus wagon train and ran it through Disneyland to a Circus he staged inside the park twice daily. 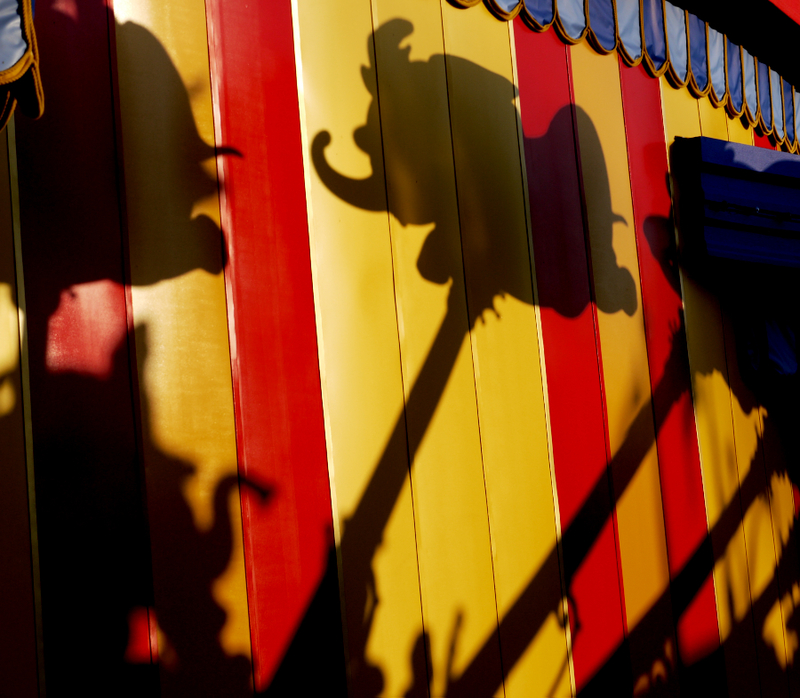 Is Storybook Circus not only the circus of Dumbo, but the circus of Walt Disney's imagination? It certainly seems so. 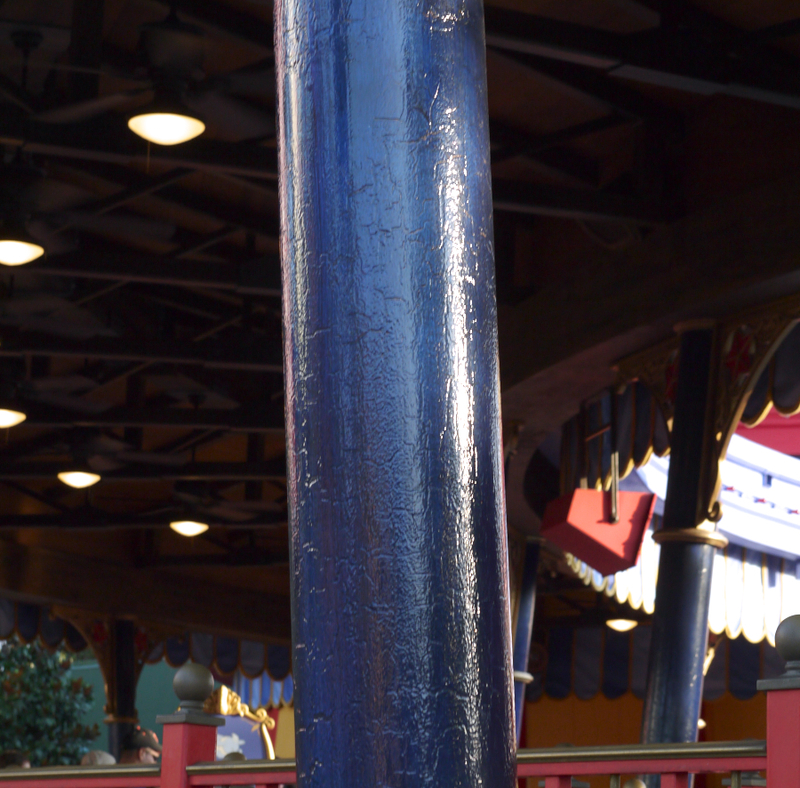 And by telling that story, it also seems to tell the story of the impetus behind the entire Magic Kingdom itself. It's the origin story for the entire theme park. It's a neat trick because the area suggests this all on its' own. You do the work. On a strictly aesthetic level, besides that interestingly meta groove it hits, the Circus is an unqualified success because it has an astonishing and beautiful array of textures. 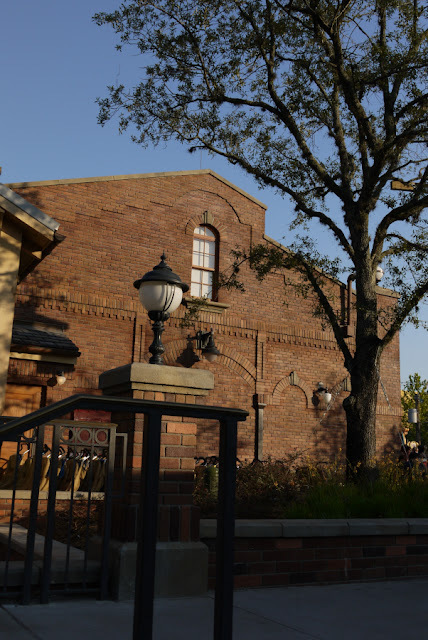 The stone walls, the weathered bricks, faded woods, and leafy foliage speak to an attentive eye towards the more lasting grace notes of the existing park, and could not be further from Toontown Fair. The Casey Jr play area, which is designed to closely mirror Ward Kimball's charmingly fluid design seen in Dumbo, is still fully fitted with detailed hinges, latches, hooks, wheels, and real metal parts. Instead of a smooth fiberglass sculpture of a train, it looks and feel like a real train. There's even a brass bell that actually rings - not a piped in sound effect! 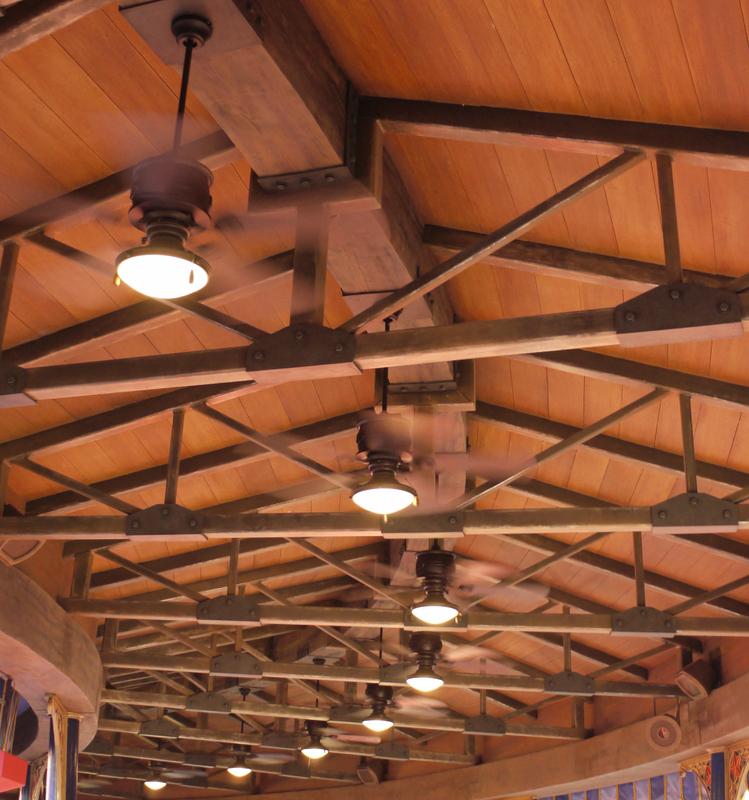 Or the undersides of the Dumbo queue's "wings", which could have been smooth drywall or a drop ceiling, are full of timbers, beams, brackets, bolts, and other signifiers that this structure had to be built. Thousands of people walk underneath this every day without realizing how beautiful all of it is because it's all fake. It's so fake that bypasses credibility to become convincing. Notice how each hanging fan has chains dangling to turn them on and off; the detail is so natural that we never stop to think that these fans are controlled by a switch and so the chain is purely decorative and had to be put there by somebody. When was the last time you were honestly fooled by a theme park? 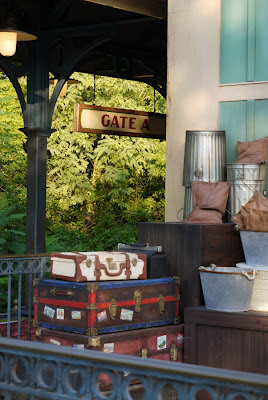 Outside The Barnstormer: real canvas, real leather, real metal, real wood..... the dirt is fake. That sort of stuff tends to add up to a lot in the mind. One of these looks like somebody put care and thought into the presentation of the gag with room left for fine texture, and the other looks like a bunch of Imagineers getting jiggy with a band saw. Storybook Circus interprets its landscape in terms of hills and terraces, which is one aspect I've identified as a common satisfaction factor in themed design areas - is there a lot going on visually and can you have more than one view of any given area? This is one of the reasons New Orleans Square is the best part of Disneyland, and the Circus has staircases, walls, hills, and elevations galore. This is something else Toontown failed to capitalize on, positioning all of its elements as it did along one long, even, steady slope. In Circus we walk upstairs towards tents, we walk down to get to the railroad station, our mind and our eye is engaged. 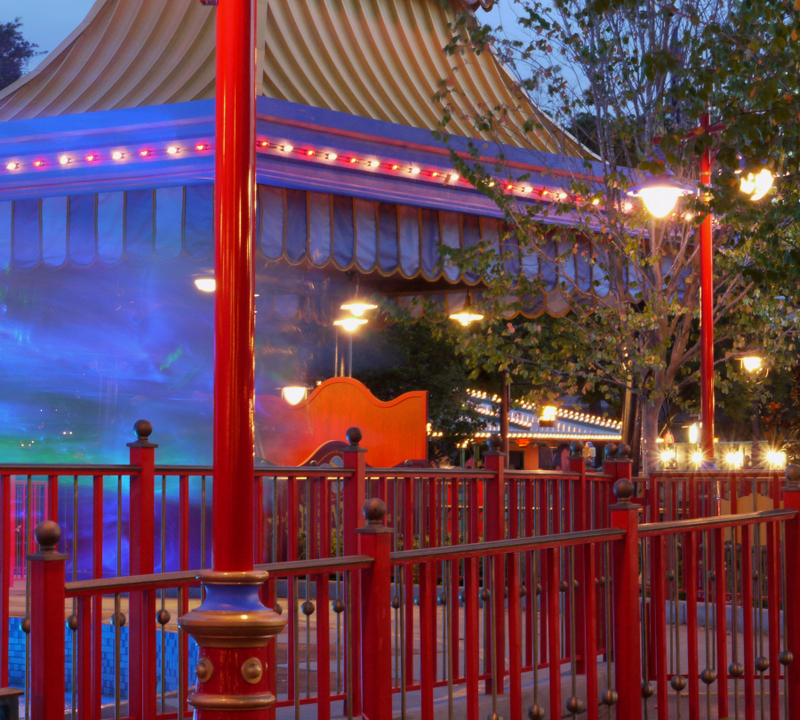 The terraces and elevations make Storybook Circus a pleasure to experience. 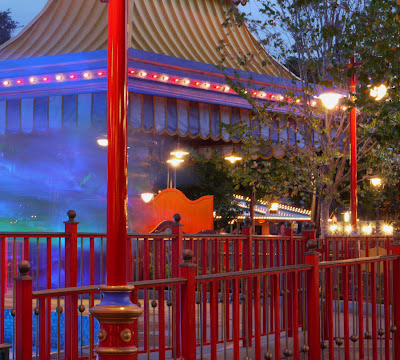 Touches like that make the Circus feel like an old friend instead of, as in the case of oh so many theme park additions, an unwelcome invasion. There's also something interesting going on over at the new Dumbo. Dumbo has never really been worthy of extended notice - it's always been pretty much the same ride in a circle over a concrete pit, with some minor Circus emphatics to dress up the spinner base. 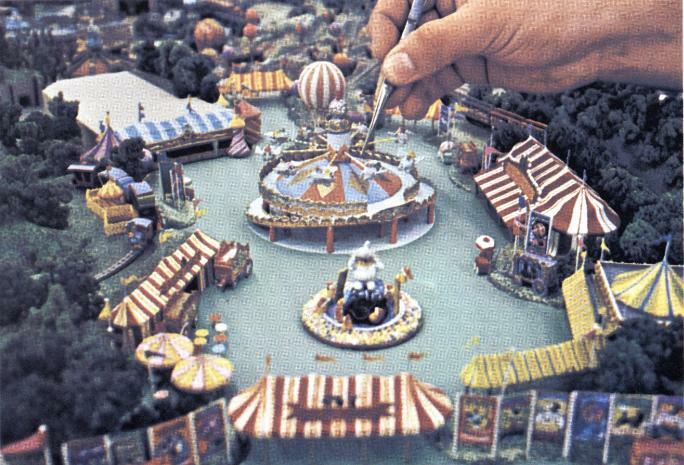 In 1983, the Disneyland Dumbo had a number of embelishments added, such as gears, workings, and pinwheels, but it was still just a fancy ride over a concrete pit in the middle of Fantasyland. The pit was now filled with water. 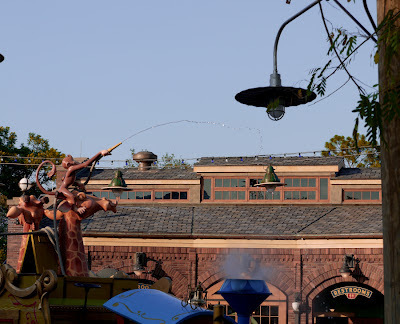 What we see in the history of Dumbo is a slow push in the direction of being a "real" ride, a fully thematically integrated ride, and now it seems as through WDI has pushed the ride concept of Dumbo to its limits. I cannot think of a single thing that could have been done to the new attraction, that has not been done, to snazz it up without changing the ride's essential format of being a hub-and-spoke over a concrete pit. There's now two Dumbos, and they spin in opposite directions, creating an immediate sense of visual excitement. 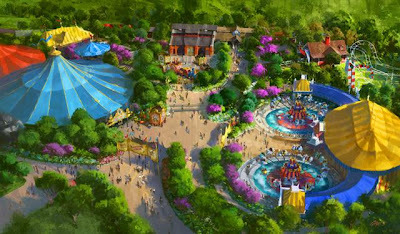 The ride has been plucked out of the concrete wasteland and dropped down admist rolling hills and spreading trees, and has a circus tent backdrop connecting the two spinners modeled closely on the one seen in the Dumbo film. Instead of just an empty room full of switchbacks or a false front, there's a whole experience awaiting us inside the tent, full of texture, and hanging lights, and a circus ring, and everything. At night, LED lights turn the water-splashed pit below the Dumbos into a swirling kaledescope of colors, a display so impressive it draws people in who simply sit and stare at the thing - it's a better show than the fireworks. But for all those emphatics, all that texture, once you get into your Dumbo it's just a 90-second spin in the air above a concrete pit. This is a C-ticket ride with E-ticket trimmings. Is this bad? There's always been different grades of rides in Disney's "castle" parks; that's the reason Dumbo was a C ticket, after all, and don't forget that it cost you about half of what it cost to ride Haunted Mansion; what were you expecting? But by surrounding a simple ride with so many beautiful textures and tones, somehow the whole feel of it has changed and so we must ask: what is it that makes a ride an "E" ticket? Is it a lot of content or perfect form? If you spend enough time enjoying the exterior, the indoor queue, and so on, it's possible that Dumbo, from door to door, offers more to see and enjoy than some of the shorter "official" E-rides like Mission: Space. How strongly does content dictate our responses to rides as "important" ones in our daily experience of the parks? 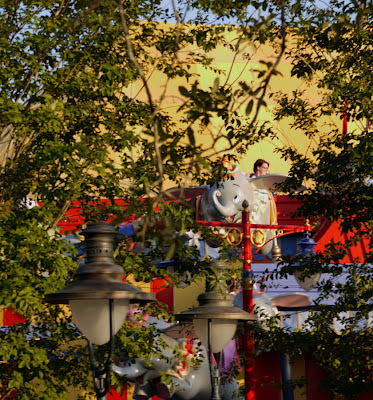 I think what Dumbo is now is a new kind of spinner ride that we haven't seen yet. It's a simple ride, but instead of presenting itself as just a simple ride, space is reserved for "doodling in the margins". It's the Hope Diamond of spinner rides, so beautiful and so fancy that we visit it and ride it and see it just because it's there and it looks impressive. I couldn't tell you the last time I rode Dumbo when it was over behind the Carrousel, but I've been on the new version dozens of times. At what point does a park experience cross a line out of being a sideline activity and become a "main course"? What Dueling Dumbos promises to do is finally to make all of the other spinner rides at Walt Disney World look pretty lousy. Why wait thirty minutes for the Astro Orbitor when Dumbo is three minutes away, looks nicer, and never has a line because now there's two ride mechanisms? Or is the average person's experience of the theme park less compartmentalized? As Fantasyland and Storybook Circus ramble on into history, we'll learn something about the attention spans of vacationers, I'll wager. And speaking of responses, it would be remiss to close out any discussion of Dueling Dumbos without mentioning what the interior queue is. It's a playground, and not an Image Works or Winnie the Pooh Queue-style playground, but an actual circular rumpus room with nets and slides and all the other things. The idea itself is interesting: since the number one complaint of guests is and has been waiting in lines, and since guests are always looking for new places to sit down on, why not let them do both while waiting "in line"? I am not really in a position to comment on the playground itself. It is certainly more visually interesting than anticipated, with deep purples, popcorn lights, and some nice details at the edges. I do not have a child, and so the playground is of no practical use to me. It is better done than the Pooh playground it "replaces" (the one across from the attraction), and indoor and air conditioned to boot, making this an ideal spot for families. One could make arguments about whether or not Disney should actually be in the playground business, but it's already there and what is there is visually attractive and, one assumes, appropriate to its use. So we must ask: what made Dumbo, the Flying Elephant a "classic"? Was it the location? The promotional photos? The ride? 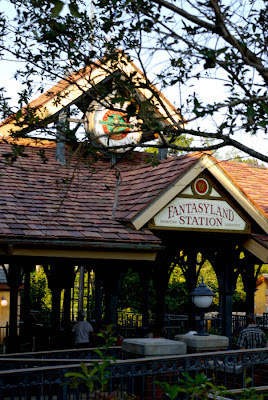 By moving the ride to a new location, Walt Disney World is betting that it will remain a "classic", and they have the thematics, the queue space, and the capacity to back this up. But whether it be the location - in a construction zone - or the fact that only so many people a day want to ride Dumbo, the crowds have not materialized - the attraction which handily garnered 45 minute waits now struggles to draw queues above 20. This could be because the capacity is now so high - sixteen Dumbos per ride system, two ride systems each, two holding pens per ride, and five-hundred feet of linear queue plus a "queue lounge" sounds more like Space Mountain and not Dumbo, the Flying Elephant. Since the lines have never materialized, the utility of the "queue lounge" playground is somewhat doubtful. It's already an entirely optional experience most of the time, and guests are unlikely to fully understand why they're being corralled into an empty kiddie playground and "forced" to sit down for fifteen minutes. We are programmed by over a hundred years of attraction development to expect to stand in a single file line and slowly progress to the front of a line to board an attraction. Disney proposes to redefine this, and the question is not only whether or not the public will understand (never mind embrace) this concept, but whether or not the attraction they chose to implement this on will ever again warrant such an elaborate pre-show area. That's a good fake electrical pole, with the vintage transformer, and now that its lights and high tension cables are up as of this writing, it looks even better. Disney has done plenty of fake power lines before - those in Tokyo Disney Sea and Animal Kingdom stand out - but this really captures a charmingly vintage feeling. Looking at it, with Casey Jr. nearby, one can't but help be reminded of Dumbo and the singing crows. I think the secret of the area's success is that for the first time Imagineering has created a satisfying dimensional representation of the feeling of Walt Disney's animated output in its' golden era. 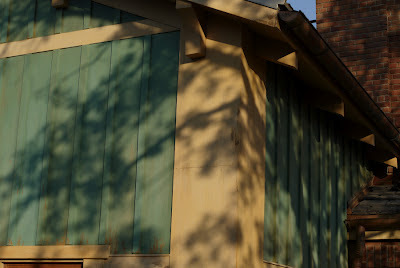 There is a pervasive simplicity, a rural feeling, a naive charm. I think this accounts for the area's already sterling reputation: it's the first thing Disney's built since themed design went permanently sophisticated with EPCOT Center that feels the way Disney things used to feel. 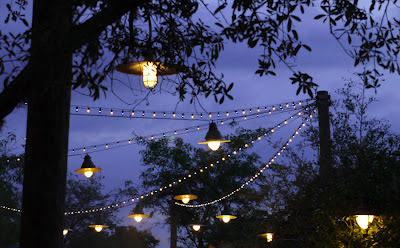 It feels simple and unpretentious and naive in the way the rest of the Magic Kingdom does. That naive sense of fantasy and design is what people pay to get into Disneyland and Magic Kingdom to experience. The return to another place and time is complimented by the return to a less sophisticated design sense. I can't quite pinpoint yet what exactly Circus does to recapture this lightning in a bottle, although if I had to guess I'd say it's a largely unconscious response to Toontown Fair. Toontown, based not on classical Disney designs but on Roger Rabbit, did never and will never be a comfortable fit with the rest of a "castle park". But Storybook Circus fits right in, and could have always been there. I think it's fortunate that it actually is. You state you saw Mickey's Birthdayland as a child. This area opened in 88. Did you not experience WDW in the 70s? I always assumed you did because your articles capture the feeling of the first decade so well. One of your best essays in a long time. Expertly argued. Wow. Color me amazed. Here I thought the whole Fantasyland addition would be a one-time walkthrough like the dreadful Bug's Life DCA thing, or the shameful Avatar disaster sprouting up at DAK. Now I'm actually excited to visit at least part of the new Fantasyland. And it gives me hope for the future, if Disney ever decides to fix MGM or Epcot, or Tomorrowland. 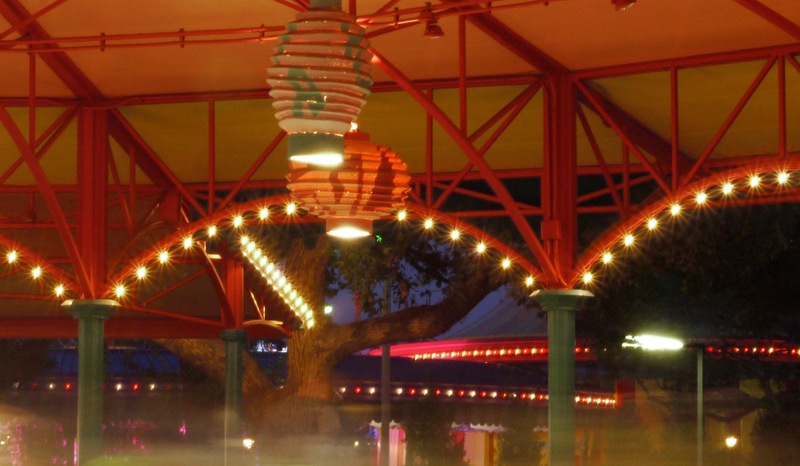 Wonderful article: you just rocketed Storybook Circus to the top of my must-see list at WDW! Being a huge Roger Rabbit fan, I love Disneyland's Toontown, but I see your point. I do think Alice In Wonderland is the biggest exception to the "normal" Disney look, and I enjoy all the Alice-like influences in Toontown, particularly in the doors, doorknobs and windows (which also made their way into Who Framed Roger Rabbit). 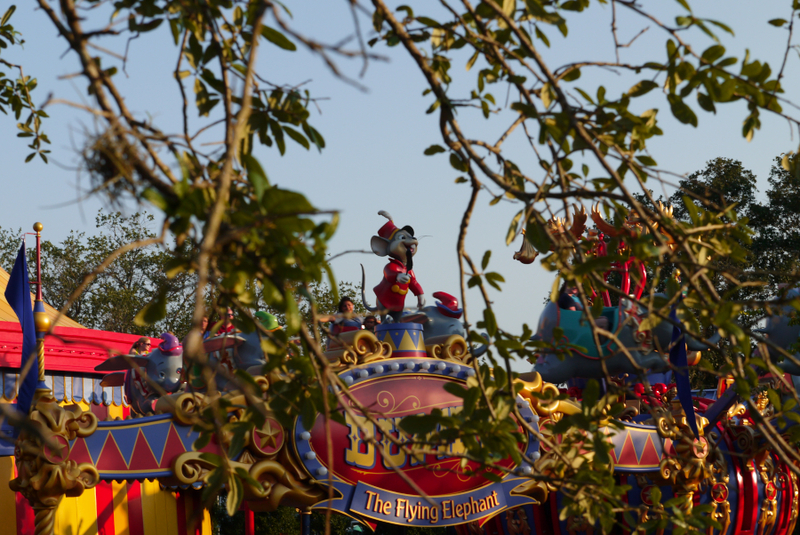 Dumbo, however, has always been much more than a spin over a pit -- it's a state of mind! 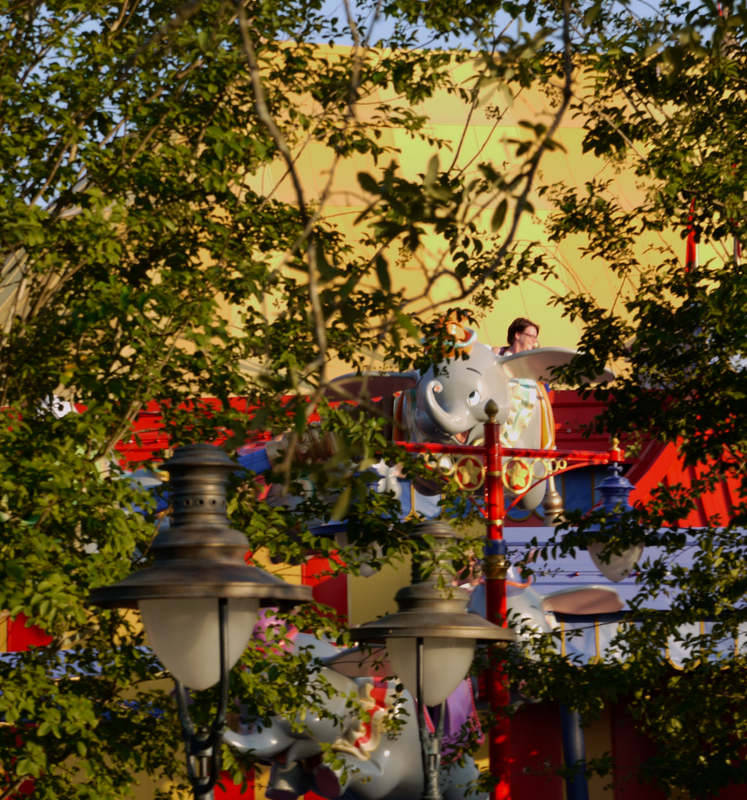 It's a chance to pilot an elephant with the summer air in your face and Fantasyland spinning about you! This ride has never failed to make me smile, no matter where it's been located. I was a bit concerned that the new doubling up would make the ride seem less "open", but I haven't heard that complaint from anyone yet. Thank you for such a thoughtful examination of how much Disney's relied on the "toon" look lately, and how much more varied and beautiful a classic animation tribute can be. When I think of children's areas, I always flash back to Disneyland's Tom Sawyer Island and its wonderful half-real, half-fantasy blend of architecture, signage and landscaping. It seems Storybook Circus is indeed a great move in the right direction for the Magic Kingdom. I'm shocked to see someone who is usually such a thoughtful researcher say that the Fleischer's created Popeye." "Popeye" was of course created by E. C. Segar for his comic strip "Thimble Theatre" in 1929. Excellent analysis as usual! I've never had much interest in visiting WDW since finding out that the 20,000 Leagues Under the Sea attraction had closed, but my girlfriend feels about Beauty and the Beast the way I feel about Jules Verne, so I'm preparing myself for a potential trip a few years down the road. It's nice to see trhe expansion vetted by someone who can appreciate it in an involved way. I agree with Rich that Dumbo is not just a spinner ride, though I might use less romantic language in keeping with your tendency to eschew the marketeering lingo ^_^ Dumbo distinguishes itself through a mix of novelty and great promotion. First of all, while I like the AStro-Orbitor as a kinetic sculpture, you're not piloting a rocketship or a plane or anything else that this sort of ride is usually themed to in every other iteration. You're riding a flying elephant. That's kind of awesome! Secondly, the ride has achieved iconic status. As one of the most visible of the opening day rides it has the distinction of being a key element of what makes a Disneyland... Any number of rides are optional, but Dumbo and the Teacups are not. They are Disneyland. Photos of a family giggling while on it are just as powerful and recognizable a symbol of the park as fireworks over the castle. Besides visiblity, there is something in the phraseology which captures the sensibilities of Disneyland: "You will believe an elephant can fly"... Something both delightful and impossible, yet given as close an approximation as can be made. I think it was the ride moreso than the movie that gave rise (so to speak) to Dumbo's evening show appearance over the castle. 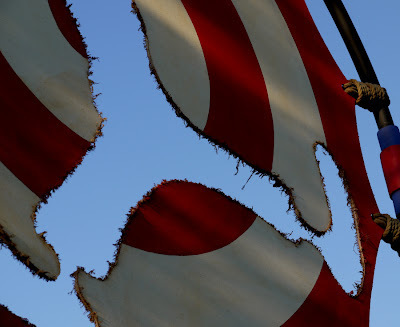 Excellent and astute analysis of Storybook Circus. This area could have been a disaster. I shuddered, as I’m sure did others, when I saw a circus would be part of the Fantasyland expansion. Circuses are a dangerous thing in the history of Disney parks, with Walt’s failed attempt at introducing one at Disneyland a case in point. People didn’t go to Disneyland to see a circus, as Walt discovered. Further, I suspected many younger guests today would have never experienced a traditional circus in real life. My fear and trembling seemed justified. For about a hundred years, from the mid-nineteenth century to the mid-twentieth, circuses and carnivals represented the ultimate exotic experience for most Americans, especially those in rural areas. They were complete breaks with reality and the only ones (especially before movies) that most people ever experienced. Walt Disney knew this from personal experience. But the traditional circus experience is exotic in a completely different way from that in which Disney typically presents its version of the exotic. The Disney parks, in spite of “here you leave the world of today,” are not so much about transporting people to the exotic as about connecting the exotic to the familiar, of taking visitors outside their comfort zones while letting them stay inside their comfort zones. Throughout the Disney parks you see the dynamic: a fantasy castle (the exotic, the unknown) sits at the end of a small-town Main Street (the familiar, the comforting). In the Magic Kingdom’s Adventureland, the Victorian gingerbread, established on Main Street, guides us gradually towards the jungle (in the Swiss Family Tree House Victorian artifacts such as a pipe organ and ship’s wheel literally meet the jungle—which is, after all, the whole point of it and what we like about it). Disney wildernesses almost always have a steamboat or a general store or a gristmill well within sight. Environments are often homey (haunted mansions included). We tend to proceed from the relatively familiar, even when the familiar is nostalgically recreated history, into the more exotic, dangerous, or unknown. (It is, by the way, for this same reason that Stephen King’s work has always been so popular—his fantasy is rooted in the mundane—and why Peter Jackson’s LOTR trilogy works so well). This park experience mirrors what happens when we go to the movies, where we are often transported to exotic, unusual, unfamiliar, or unsafe territories, all the while secure in our comfortable chairs sipping our sodas. It also mirrors Walt Disney’s life experience. One of the reasons Walt resonates with so many and why he is one of the great icons of American culture is that he embodied this juxtaposition of the familiar (the small-town Mid-west of his early years) and the exotic (the world of Hollywood and celebrity). 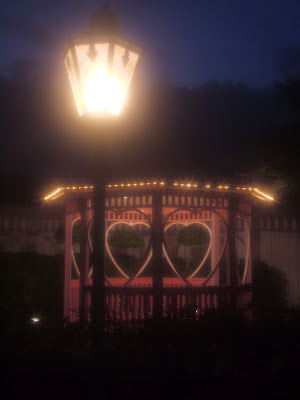 Disney’s artistry makes us feel safe rather than challenged: it is the artistry not of bohemia but of the bourgeoisie. He was a man perfectly in tune with the worldview of mid-twentieth century America. 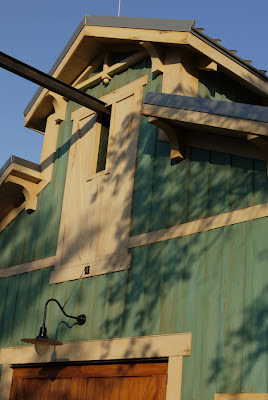 The imagineers of Storybook Circus seem, consciously or unconsciously, to have tapped into this dynamic. The point is not that we are being transported to the circus but that we are being transported to a familiar, rural location where a circus has set up for business (as you adeptly point out in your essay). 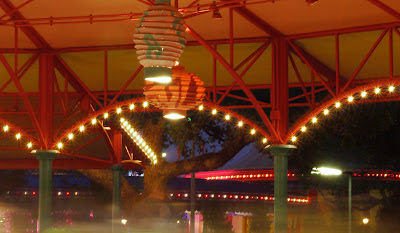 We are connected to the familiar, to a world we understand if not from personal experience, then at least through its archetypal importance in the culture; we are connected to the Main Street through which we entered the park (the literal connection of the railroad makes Storybook Circus a “microland” that is as much ancillary to Main Street as it is to Fantasyland); and we are connected to Walt Disney’s childhood and to the small-town milieu that always remained a part of his vision. From all indications, they really did get it right. Great post - I loved Story Book circus during the day time. It's a real triumph. After first going as a kid to see Mickey's house it's the first time the most child orientated bit of the park has really merited a visit if not with young children. That said my brothers family went to Dumbo and thought the queuing amazing. Normally excited children are hard to stop running & climbing on scenery in queues but there my neice and nephew were never happier. 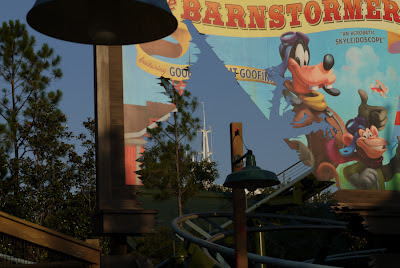 The whole area is so well integrated and rides the vintage/nostalgia bandwagon perfectly. On my last night I saw how great the area looked on the way out of the park and really will have to see it then if I ever get to go back. Hope so as the new bits elsewhere I saw in Fantasyland looked promising and the models of the finished area potentially a real visual treat. I've read it several times now; you truly articulate all the visceral feelings that Storybook Circus evokes. Your analysis is incredibly thoughtful without feeling overly-analytical and specious. Thank you so much for all of your wonderful work. Please keep doing what you're doing! If I had one complaint about Storybook Circus, it's that they didn't commit to treating it like a proper Land, giving it a dedicated section in the guidemap and at least a little room to grow instead of smooshing the new Fantasyland rides right up against its borders. Though I'm not sure what they would be able to add, given the theme they already committed to. Maybe a "real" circus show in a full-sized tent starring the costumed characters that runs every two hours, somewhat similar to Festival of the Lion King.